From breaking the sound barrier to saving lives, Bell aircraft fulfill various important, incredible and even unexpected missions. Through customer collaboration and international expansion, our technology’s versatility continues to grow, creating new opportunities for our aircraft to change the world – or show customers new parts of it. Independent Representative, National Airways Corporation (NAC) offers various charter flights all over South Africa. Recently, NAC pilot, Shaun Morris, was tasked with transporting an anti-poaching group to Chinko, a remote African park. Morris flew the Bell 407 into a tropical rainforest complete with a diverse array of wildlife and viewed different parts of what he called “Eden.” According to him, one of the benefits of using rotorcraft to navigate this new territory is the ability to land anywhere and wait out a rain storm before continuing the journey. His adventurous flight into the park demonstrates how customers can use Bell aircraft to provide quick and easy transport for conservation efforts, as well as access to the hidden paradises of the world. 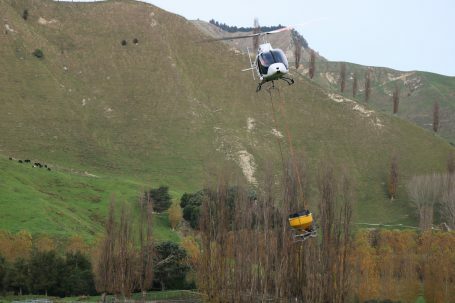 In New Zealand, Bell customer Rangtikei Helicopters used their new Bell 505 Jet Ranger X to assist with its first ever agriculture hook operation. This new mission comprised of lifting and spreading multiple loads of fertilizer from trucks onto steep hill country with a total of 775 kg total hook loads. As the Bell 505 continues to expand its international reach, the aircraft adds more capabilities to its mission set and proves it can take on utility operations.